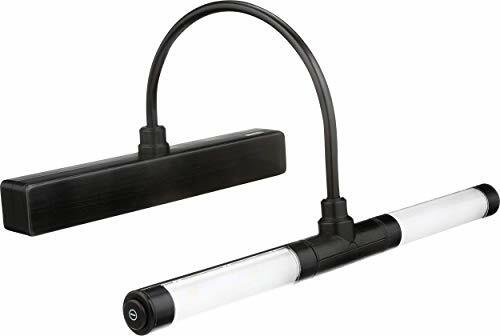 The Rite Lite LPL601XLB battery operated Super Bright LED Picture Light is great for drawing attention to artwork, diplomas and degrees. With this stylish LED picture light, you'll bring your cherished pieces to the center of attention. The design mounts easily and extends out and over the picture or item you are presenting. It's extremely versatile with a folding neck for compact storage and adjustable light heads that you can direct independently. With it's battery operation, no wiring or installation is required meaning no more cords hanging down the wall taking attention away from what is being displayed. Features 70 lumens of light output and 3000K color temperature. AmerTac manufactruring brands including Rite Lite offer complete lines of distinctive decorative home accent products that include trend-setting wallplates, money saving LED night lights, innovative under cabinet lighting and LED battery operated lights. More functional product lines include energy-saving timers, dimmers and lighting controls, as well as an extensive offering of consumer electronics accessories for the home and office. AmerTac's products are distributed to leading home centers, lighting showrooms, mass merchandisers and supermarket chains throughout North America. If you have any questions about this product by Rite Lite, contact us by completing and submitting the form below. If you are looking for a specif part number, please include it with your message.